Traditionally handcrafted baby foods- primitive techniques by Nutreatlife Startup. 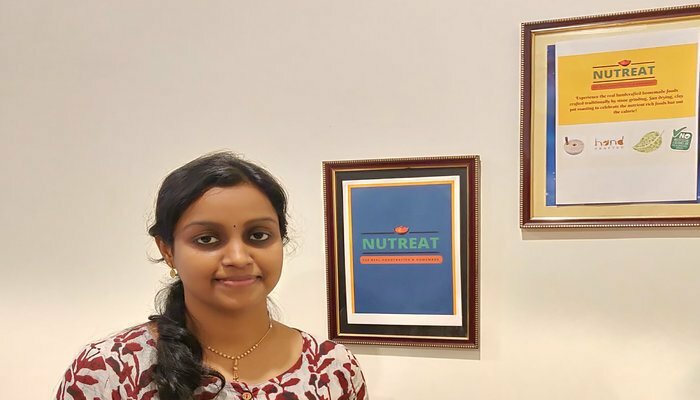 South India based Startup Nutreatlife provides real handcrafted homemade foods for babies and kids. Meet Jyothi Pappu Founder of ‘Nutreatlife, shares her complete story with StoryToday. We have asked several questions regarding the complete business concept, her future plans with this startup and especially what problems she has faced while building this startup to motivate our audience who are still planning to chase their passion & dreams. Here she has described her story, let’s jump to questions. 1. Tell us everything about your startup, what does it do? What were the challenges of setting up and scale? How did you overcome them? To say it in one word about our startup, Nutreat is “handcrafted in a traditional way” for the providing best nutrient-rich foods for babies, kids & small range of foods for the entire family without any empty calories. We craft Nutreat by stone grinding, sun drying, clay pot roasting etc. People are slowly coming out of the myth that poor foods of the rich countries are not for us, they are rethinking about our traditional foods. So, Nutreat provides the best possible traditional foods. As the path we choose was completely unique though it is a primitive technique every step was challenging before and now. The main challenge was getting helpers. People are not that interested in producing the flour in a stone grinder after these modern electronics. But still we had overcome this by offering more than regular daily wages for them and the second biggest was the “people”. We always look for easy and fancy things but not the facts. The same way people are much interested in Baby foods imported than produced locally. Most of the people even well-educated think imported foods are always superior. For this I had to work for about a year, convincing the customers about the preservatives added, regarding the empty calories and providing the samples in large amounts. But once they tasted no customer bought highly processed foods. Besides these, the place where we live was a big hurdle in the early stages as it is a rural area I got no chance of retailing or exhibiting. People in our area are no scope for marketing my product initially. I had to find my market through lots of research until I signed up for Amazon. 2. How did you come up with the idea and what was the Eureka moment? It was in the year 2012, when my first son was born I was researching about his first foods in the market. But none of them hiked me as, almost all of them are with preservatives and being a pharmacy student (pursued my masters from Sri Ramachandra University) I know the side effects these ingredients well. So, I thought I would make this one for my li’ll one. For this, I had to research again by consulting some pediatricians, friends, and internet and finally, it was my Grandmother who gave me the real traditional recipe for baby food and she warned me that I should only process this using stone grinder. After my son, I shared this recipe to most of the friends but as most of them are working they asked me to prepare. These requests made me to think about crafting it commercially with the support of my husband in 2015, in Malkipuram located on the banks of river Godavari. Initially, when we started giving it to near and local retailers. But a call from Gujarat (I don’t know how she got the pack) saying “thanks for this, my baby eats only this and she is gaining her healthy weight now” was the real moment that made me confident about my products. As I was totally a newpreneur I didn’t even asked her to write a testi. Day by day we are growing and developing the skills on marketing. 3. How did you build the core team (co-founders and initial employees) – How did you meet and how did everyone align with the idea? What is the total team size? I alone lead my company with help of my husband who takes care of all the financial matters. However, I should say he is the investor for this as he is the person who believed in my concept and encouraged by investing capital. And I am accompanied by 4 women helpers. I should call Manga (45-year-old) & Lakshmi (43-year-old) are the main crafters of Nutreat as they are the people who stone grind the rice & other ingredients, the hands behind crafting Nutreat. Durga (22-year-old unmarried girl) is really talented and supervises whole crafting, packing, and other simple marketing processes when required. I should say I can rely on her whenever necessary. Along with these, we have occasional helpers (Suda & Ramana) whenever required depending upon production volume. 4. Give us a background of your core team and yourself with the age. I am really fortunate to have all the luxuries in my life with no roller coaster rides, but however, it was never that interesting till I have started crafting Nutreat. Most of my family members are group-1 holders and expected me to be the same. After completing my masters in pharmacy practice, they all advised me to try for DI. But it was never my cup of tea. After my marriage ( I was 24 years old then) we have to live in a rural area where my husband works for ONGC as an EE, and almost all the gates were closed for my career plans. Some of the pharmacy colleges around us were the only option if I wanted my career. But teaching will never sync with my mind. It was in the year 2015 when my son born and I was researching his first foods, I found no product as a homemade food with lots of preservatives & artificial ingredients. This really made me to think about make his first foods on my own. The recipe & process of preparation were shared by my grandmother. Her only condition was to prepare it in a traditional way to get the maximum and true benefits. This happened when most of my techie friends asked me to prepare the baby foods for their kids. After deciding it took me a year and half for research, official process, and brand registration to make it commercially available. Manga and Lakshmi were totally ill literates yet they won their masters in using primitive house-hold techniques. This was the main reason that I am able to move on. Durga passed her 10th standard and due to her family background she had to discontinue her studies, but I feel she is the captain of my helpers. 5. What has been Revenue, traction, and growth from the date of inception till now? I have invested INR.25 000 as capital with totally a vague idea on marketing but with a masterpiece in the home, my husband is my ultimate financial advisor. With his support only I am now earning up to 2 lakh per month and I expect this year I could reach up to 5-8 lakh per month. The only traction that drives us is the feedback that we are receiving from our customers. Though we receive only a few written feedbacks mostly when have our repeated customers both offline and online. Most of our customers say that they are dependent on my products as they trust us. This made us earn up to 5 lakhs in a month in the year 2017. 6. What is the one thing that sets you apart from your competitors and what’s your revenue model? Following ‘primitive techniques’ for processing is the one thing that makes us unique in this market. There are people who are producing this kind of baby & kids foods yet most of them are also processed using latest techniques. Our products are near to the nutritional facts with no empty calories and we craft Nutreat only when we get the freshest from the farmers grown with no chemicals. This might put us a li’ll back in this commercial world but still, we ride on this way only because we are motivated with only one soul aim “encourage eating local produce with rich nutrients for real radiant health”. Hence our revenue model is 100% based on production quantities. 7. What are the unit economics and margins for a business like this how does the model work? Unlike most of the FMGC’s handmade products should be priced more as well as have to offer more margins to the retailers. Both the producers and retailers should face the rick on belief, without minimum margin of 18-20% retailers won’t risk. In the case of dealers, we are half stolen, as they demand a margin of 30-40%. Amazon takes 16% which quite reasonable. For Nutreat we should consider it as a ‘sustainable growth’ though we don’t get huge profits sometimes we never faced the loss till date. 8. How are you funded? Nutreat is self-funded, my husband has supported me both mentally & financially to no limits. 9. How is the product built and manufactured? Nutreat is a handcrafted homemade food for babies, kids & small range of health foods using the traditional processing techniques. We handpick the raw ingredients directly from the local farmers and sun dry them for improving the shelf life. Ingredients like rice, millets are stone grounded to retain the maximum nutrients and they are slow roasted in clay pots (this enhances its taste). We don’t use any kind of preservatives or artificial ingredients to increase the shelf life as we believe food should always be consumed fresh and before it spoils naturally. Hence our products have a very low shelf life of 6 months like most homemade foods. We are currently in few retailers in Andhra Pradesh & Telangana with 5 products in the market and we are going to release 6 more this year. We are readily available on Amazon and other health sites, once we are ready my friends are ready to tie-up. I Jyothi Sri Pappu founder & CEO of Nutreatlife and mother of 2 li’ll boys, pursued my master’s degree in Pharmacy Practice from Sri Ramachandra University, Chennai and now has started handcrafting foods for babies, kids & health products in a traditional way using Primitive Indian techniques like sun drying, stone grinding, germinating, clay pot roasting which are found to be disappeared in these modern days. So I craft homefoods in a traditional way for real radiant health aided by women helpers.